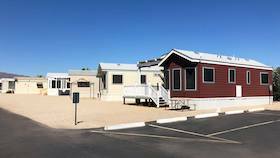 Leaf Verde RV Resort is an all-ages community located in Buckeye, Arizona. The community offers a clubhouse with a fitness room, game room and computer station. Outside, residents enjoy a swimming pool, shuffleboard, pickle ball courts, horseshoes, and BBQ area. Other amenities include laundry facilities and a dog park. Leaf Verde is close to restaurants, shopping, golf, and hiking and biking trails at regional parks, with Phoenix nearby for many cultural and entertainment choices.